Google Search: The most obvious choice. During the fag end of the 90’s finding information online was something left to chance and luck. The internet was a disorganized world and Google became the index and road map to this jungle changing the way we access information. It has effectively destroyed the monopoly of libraries as the repositories of knowledge and also made the process of memorizing something totally redundant. In total one can say Google has democratized the way we seek knowledge today. Youtube: If Google became the default index to the internet then Youtube placed a camera to our world. Finding a video clip in the 90’s and early 2000’s was a task that involved raiding multiple video libraries. This reminds me of a movie song I shot with Prabhu Deva in 2002 that involved some shots inspired from a Michael Jackson video. It took me days to find the right VHS tape and a few more days before I could edit out the relevant portions. To do the same today I wouldn’t need to step into another video parlour, wait, do they exist at all now? Online Chat: A path breaking phenomenon during late 90’s and is still the most popular means to connect with people online. Along with the ability to communicate, chat also introduced for the first time the process of typing real-time. Never before in history was it necessary to learn typing unless one was applying for a government job. There used to be typing centres that taught us how to type as it was a special skill. These centres don’t exist anymore as Chat made it compulsory that everyone learnt how to punch keys on a keyboard in real-time, it became more of a necessity rather than a special skill. Mobile Phones: If one were to pick a topper in this list then mobile phones have to take the crown. They have had the biggest impact in our lives by making us accessible at any given time. It is a case of gaining freedom at the expense of loosing freedom. STD ISD Public telephone booths are now almost relics of a bygone era. Mobiles have also effectively killed the need for alarm clocks and calculators. I speak of only the basic phone models here, in case I start talking about smart phones another complete blog post won’t be enough to cover it all. SMS: A crucial element of mobile phones but a very significant one. Most people sms more than they talk on the phone today. It has effectively buried the concept of the telegram and even threatens the existence of emails which in turn killed the art of letter writing. Leave alone letter writing, nowadays most ppl dnt evn knw hw 2 frm a cmplt sentnce, thx 2 sms. Telemarketing: Speaking of mobiles and sms’s how can one forget the ones that call and message us the most today, the telemarketers. Call it spam or junk, there is no escape from this new form of nuisance that we never had to endure in the past. On the other hand it has created huge job opportunities for people to work in call centres. This in turn has had a huge impact on the spending capacities of our youth and their aspirations whose choices were extremely limited in the 90’s and before that. Malls: The biggest manifestation of these spending habits lies in the emergence of malls. What used to be melas earlier have become malls now, a year long shopping festival and a one stop solution for all our materialistic needs. Malls are now the choice for us whether to buy clothes, electronic goods, food items, to having dinner, watching movies, etc. In a way Malls are changing the very landscape of our cities and societies in general. Multiplex: I add this under a separate list as movie watching is a national pastime and the way we watch them today is very different from the way we used to do it back then. Standing in a queue to grab the tickets in advance booking for a new film in a huge single screen auditorium was the norm for decades. Not to forget the black marketeers. Multiplexes changed this format forever. Online booking is common today and thanks to the exorbitant prices of the tickets as well as popcorn we have become very selective about the movies we watch on screen now. This in turn is heavily influencing the way films are made and marketed these days. Online booking: I don’t remember the last time I ever visited the railway reservation complex or the telephone department or any other public utility service that has a mode to pay bills or buy tickets online. Online booking has killed the concept of a queue and we prefer to do these tasks sitting in the comfort of our homes, a luxury never available to people just few years back. And yes, none of this would have been possible without plastic cash, the friendly credit card. Private Banks: Prior to the 2000’s banks were mostly government institutions with high handed officials who made you feel like an unwanted guest. The influx of private banks changed the scenario forever by introducing us to swanky interiors and smart staff that spoke well and effectively managed to sell us ATM and credit cards and seduced us into the wonderful trap of easy EMI’s. Private Airlines: Indian Airlines was probably the only airline that one would have ever flown before the influx of private airlines like Air Deccan, Jet Airways, Kingfisher, etc in the last decade. The average Indian is now more airborne than he did 10 years ago. Fast Food Chains: Fast food chains existed in the 90’s too but the 2000’s are truly the time when they exploded onto our landscape. Coffee Day, Barista, Mc Donalds, KFC, Pizza Hut, Dominos, etc, all of them grew tremendously in the 2000’s replacing our friendly neighbourhood cafe or bakery as our first destination. Add to that the concept of home delivery; our eating habits are not the same anymore. Digital Cameras: The neighborhood photo studio and the film roll that we bought from there was a common feature in the past. Photography was a very expensive affair and one had to be judicious about what one was clicking as each click cost a lot of money. All this changed in the 2000’s as digital cameras made their way into our lives. The only reason we enter any photo studio today is to get passport size photos clicked. Thanks to digital cameras we nowadays don’t even have physical photo albums in our homes but virtual ones mostly stored on Facebook and other such sites. Reality TV: While the 90’s bought the cable TV into our homes the 2000’s bought in the element of interactivity with the influx of reality shows that judged its contestants based on our sms or phone feedback. Gone are the days of writing letters to the channels. Two other things that mushroomed on TV are the multitude of news channels and the plethora of Saas Bahu serials. Unfortunately both of them are farfetched from any kind of reality. Also in danger are all the small time cable companies as set top boxes are becoming the norm nowadays. Twenty20 Cricket: Cricket is probably the most watched programme on TV. Twenty20 cricket, especially IPL has redefined our expectations from a cricket match. Even one day matches seem like test matches today. Thanks to our reducing attention spans we are now fed a dose of slam bang cricket spiced with a few cheer girls in-between so that we don’t take our eyes of the screen. Everything has changed in the past decade with respect to cricket except for one constant, our continuing admiration of Sachin Tendulkar. Security: Another phenomenon that we notice today, unfortunately due to the events of September 11 and various other terror attacks, is the focus on security. Never before in our lives have we been frisked so often and passed through metal detectors. Some simple pleasures of life have been replaced by fear and suspicion. Something we definitely wish had never changed since the past decades. I can go on with this list forever as the topics are endless. I haven’t even mentioned Facebook, Twitter, iPhone, death of the tape recorder and audio cassettes along with VCR's, emergence of DVD's, flat screen TV's, gaming consoles, etc, etc in my list. Now it’s your turn to add to the list. 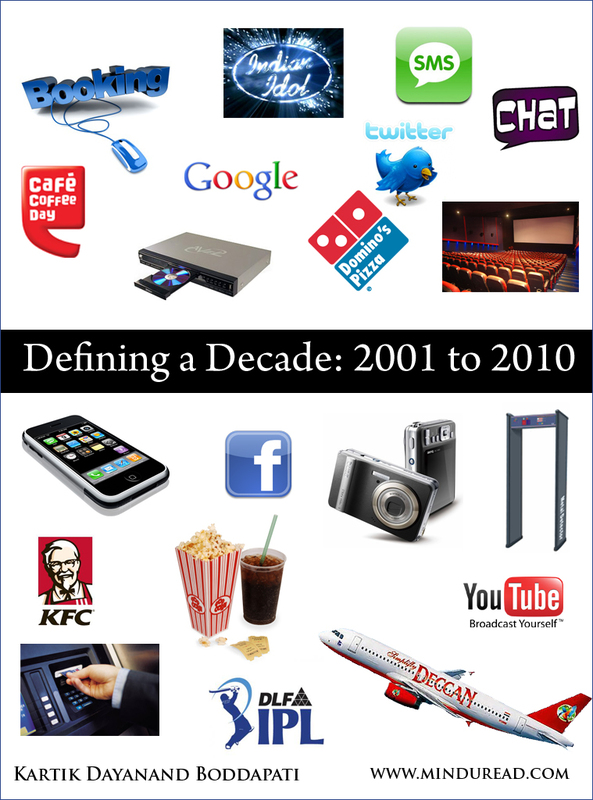 I also shudder when I think how much our world has changed in just 10 years time. Suddenly the 90’s seem like they belong to the stone ages. Wonder what 2021 will look like? Will we make a similar list then and wonder how backward we were in the first decade of the new millennium?